DETROIT — Voters in Michigan will decide in November whether to entrust how their voting districts are drawn to an independent commission rather than the Legislature, which could alter the balance of power in a state that Republicans have controlled since 2010 and where Donald Trump eked out the slimmest of victories two years ago. Three other states have redistricting initiatives on this year’s ballots and there are ongoing legal challenges to the political boundaries in about a dozen states that claim they are the result of political or racial gerrymandering — the process by which districts are drawn to favor the party in power. Three other states have redistricting initiatives on this year’s ballots and there are ongoing legal challenges to the political boundaries in about a dozen states that claim they are the result of political or racial gerrymandering. 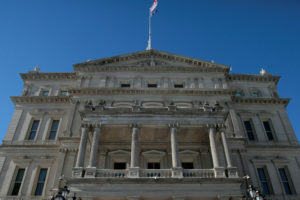 The issue is particularly charged in Michigan, a battleground state in presidential elections that has some of the most Republican-skewed legislative districts in the nation, according to an Associated Press analysis . Michigan is getting significant attention from anti-gerrymandering advocates, even as national Democratic and Republican groups are pouring millions of dollars into state races seeking to ensure they have officeholders in position to influence the next round of redistricting, in 2020. A Democratic redistricting group led by former U.S. Attorney General Eric Holder recently announced a $250,000 donation to bolster Michigan’s ballot proposal. The money will aid Voters Not Politicians, whose organizers successfully qualified the constitutional amendment for the November ballot. Two other states where campaigns are underway for changing the redistricting process so it’s less partisan — Missouri and Utah — are more reliably Republican, at least in presidential races. The third, Colorado, has a reputation for being a swing state in the past several recent election cycles but has a Democratic governor and split control of its legislative chambers. Holder and other backers of the proposal say Michigan has an unfair system that puts politicians in the position of picking their constituents. They point to electoral districts that are drawn so twisted they’d make a pretzel jealous as evidence that the map-making process is so manipulative that it challenges representative democracy. Critics include the Michigan Republican Party, which argues that Voters Not Politicians is a Democratic “front group” that seeks to lure voters into sacrificing their voice in the redistricting process by taking the power away from those elected to the Legislature. The Citizens Research Council finds elements of truth in both sides’ arguments. It points out that the current system leaves decisions to “politicians who can directly benefit from the redistricting process” and that the proposed commission would be required to boost transparency and voter access. However, it also points out that one drawback would be that the commissioners would not be elected but would instead be selected at random and only accountable to one another. Lupher said he doesn’t think the proposed change would provide an advantage to either party, at least in the long term. The AP’s statistical analysis of the 2016 election results found that Michigan’s state House districts had one of the largest Republican tilts in the nation. The AP’s statistical analysis of the 2016 election results found that Michigan’s state House districts had one of the largest Republican tilts in the nation. The AP used an “efficiency gap” analysis to measure potential gerrymandering, which is the same statistical tool later cited in a lawsuit that alleges Michigan’s legislative districts are unconstitutional. The analysis also found that Colorado’s current district maps benefit Democrats. They won a majority of state House seats in 2016 despite winning fewer statewide votes than Republicans. Courts have stepped in to choose Colorado’s district maps three of the last four redistricting cycles, and both parties have been accused of gerrymandering. A separate statistical analysis conducted for the AP by the Princeton University Gerrymandering Project found the extreme Republican advantages in some states were unlikely to be a fluke. The Princeton analysis found the Republican edge in Michigan’s state House districts had only a 1-in-16,000 probability of occurring by chance. In Missouri’s 2016 election, Republicans and Democrats both won their districts with roughly 70 percent of the vote, on average. The difference in margins does not provide evidence that Missouri is gerrymandered, according to the project’s findings. The issue in Michigan has some voter support but isn’t settled. A poll published Friday by the Detroit Free Press and other news outlets showed that 48 percent of likely voters were supportive of the proposal, 32 percent were opposed and 20 percent were undecided. The EPIC-MRA survey was done Sept. 21-25 and had a margin of sampling error of plus or minus 4 percentage points.